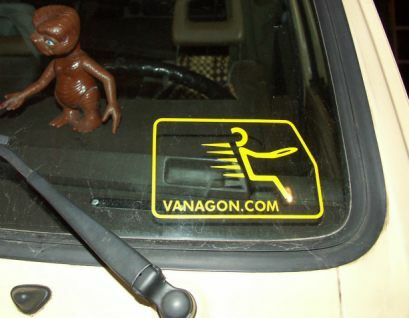 Attention Vanagon List Members....This is the winning entry of the Vanagon List Sticker Contest. After a drawn out, closely-fought, flame-filled battle, the Raul Cisneros #6 design has been declared the winner over the Debi Tippets #1 design. The self nominated List Sticker Committee consisting of Karl Wolz, Brent Christenson, John Branstrom, Sean Garret, and Frank Condelli wish to thank all List members who graciously participated in this once-in-a-lifetime event. We would like to thank the prize sponsors, Ken Wilford, Lynn Sheeley, Peter B, Mark, Bill Nolan and Marshall Ruskin, who were kind enough to donate prizes for the sticker contest. 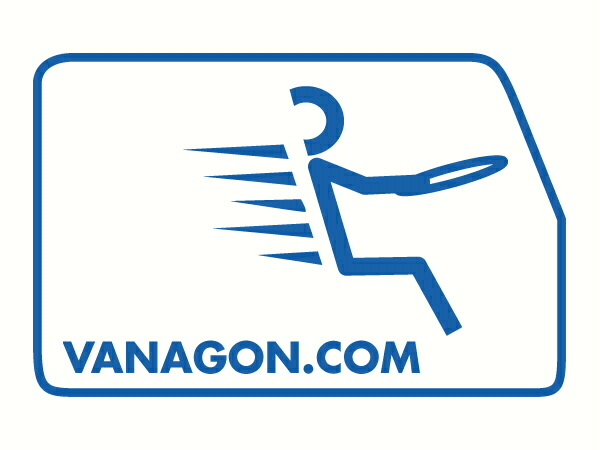 The Sticker is to be produced as a vinyl cut-out in two sizes: 5" x 7" for application to your rear window and 3" x 4" for application to your front window. 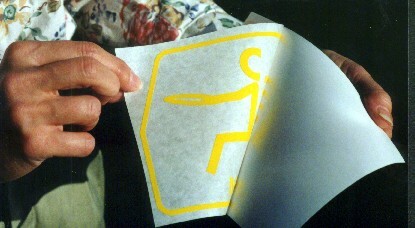 Illustrated application instructions will be included with each sticker order. 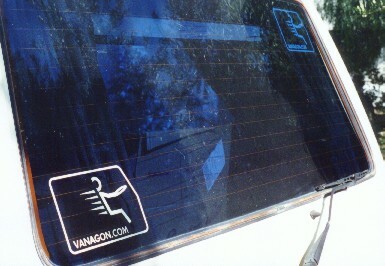 Below are photos of the sticker prototypes in place on Vanagon rear and front windows, and of the sticker being applied. 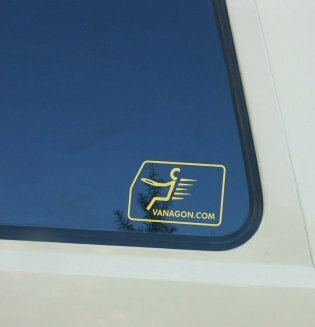 The front/back sticker set is produced as a vinyl cut-out in two sizes: 5" x 7" for application to your rear window and 3" x 4" for application to your front window. 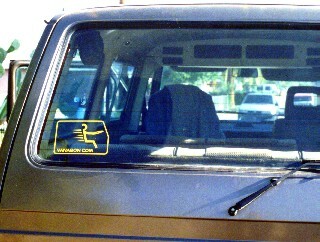 The side window sets are both 3" x 4" with one of them a mirror image of the bus and driver. 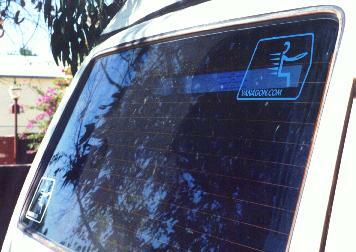 Illustrated application instructions will be included with each sticker order. 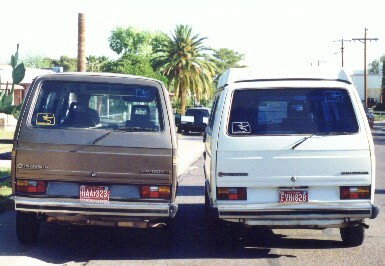 Due to rapidly changing Exchange rate please contact Tom for USD prices. The Debi Tippets design is being considered for production as a 'Fun' sticker. 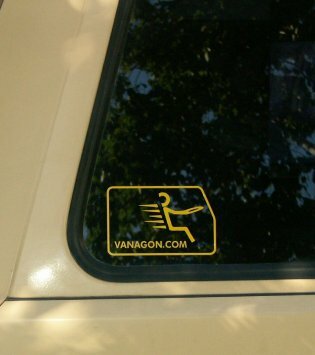 Since it requires a different printing process, and we did not want it to hold up the production and sale of the Official Vanagon List sticker, Debi Tippets' 'Fun' sticker will be produced in a separate lot at a later time after we finish producing and distributing the Official Vanagon List Sticker.